There are about 90 species of fan flower. Most of them are Australian, and seven of them are specifically Central Australian. 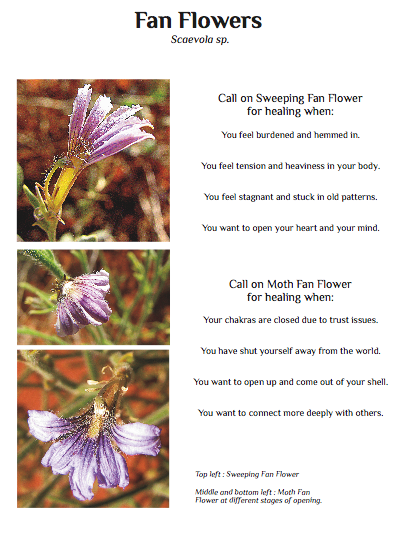 Fan flower spirit medicine expands and opens our chakras, especially the heart chakra. They broaden our sense of personal space, helping us feel more open and expansive in heart, mind and body. The first fan flower greeted me by entering my heart chakra and sweeping it clean like a broom. With every sweep, I could feel it pushing against the inner walls of my heart chakra, making them stretch and expand outwards. My heart-space began to feel larger, as though there were more room inside me for love. I felt like I could love more people and love all of them more than I had ever been able to love anyone before. I felt a pressure at the back of my heart chakra. Then the back of my body “unzipped” along my midline from heart to base and old toxic emotion oozed out of me like black sludge! This release at the back of my heart chakra prompted my other chakras to do their own smaller cleanse. The bridge of my nose felt uncomfortable, as though someone were squeezing it. This sensation spread to my inner eyebrows and ears. My third eye chakra broadened, and I had a vision of how my third eye appeared from the inside, as though I were very tiny and standing inside of it. It looked like a magnificent, roomy, light-filled cathedral. I’m a cleaner, like a broom, says Fan Flower. It’s good to have a lot of clear open space inside you. It lets more light in. I thought about this, reflecting on a flower spirit I met years ago who taught me not to hold on to clutter and baggage. Deal with things as they come into your in-tray, it would tell me. Don’t let them build up! I’m certainly better than I used to be, but I guess there is always more spring cleaning to be done. Fan Flower targeted my heart chakra because I’m often afraid to speak up when I’m unhappy, and this leads to a build-up of resentment. My third eye probably needed a good clean-out because I always have too many ideas floating around in my head and not enough time to implement them. The second fan flower, less than a metre away from the first, had a shape that reminded me of a moth. This fan flower positions itself inside closed chakras and gently prises them open, allowing light to enter and your personality more room to express itself. What causes a closed chakra? While there are many possibilities and the answers depend on the chakra and the person involved, the most common underlying cause is fear. Closing the heart chakra, for example, stops us from connecting deeply, which can protect us from getting hurt. The second most common cause of a closed chakra is depression. In this instance, the chakra shuts down and turns in on itself. After making these essences, we drove on to Ti Tree. It took us a while to find the job site, and while searching for it we drove past the local school. On the wall was a mural I recognised as my Aunt Maggie’s artwork. Maggie has been travelling between Alice and Ti Tree for years, and has done a lot of creative work with the community there, such as co-ordinating the hand painting of local buses. When we finally found the job site, we unpacked our locksmithing equipment and I watched with fascination as my husband switched into work mode, becoming all business and efficiency, his instructions and answers to questions curt and direct. I was a little taken aback at the abrupt change in his mood, but quickly stepped up and knuckled down to work. If you would like a copy of Wildflower Spirit Journey, please help me into print by supporting my crowd-funding campaign.